Tags and tagging are key concepts in vScope. Master tags and tagging (the procedure of adding tags to resources) to create powerful custom views of the IT. Tags are represented as columns in Table Explorer and as labels on the Properties page. Adding tags to a resource means that it will be categorized and thus better searchable in vScope. 1.1. What is a tag? 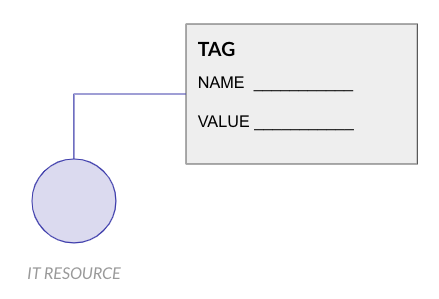 A tag is a label or notation that stores information about a resource or component in vScope. A tag consists of a Name and a Value. The Name is always in text format while the Value can be a number, date, text or boolean. Tags does not require a value but can also have multiple values. Name and values can be assigned in four different ways in vScope. Tags which name and value are managed by vScope is called “vScope Tags”. These tags are static and cannot be updated by the user. vScope Tags are a result of what has been found by discoveries. 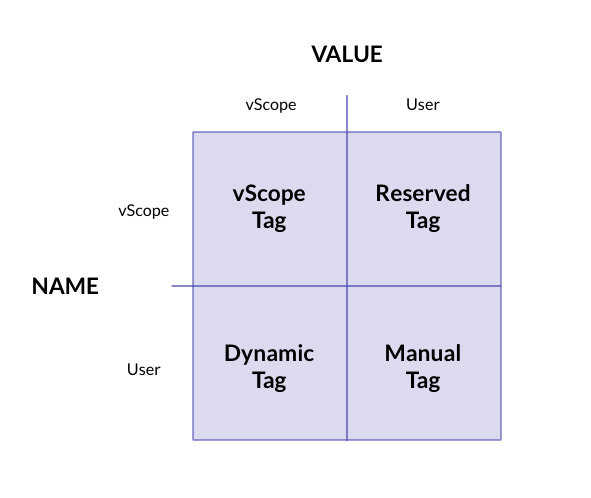 Dynamic tags are named by a user but have a value that is dynamically managed by vScope. This can be relevant for customization of the format of a tag eg. excluding a certain value from a vScope Tag or just simply renaming a vScope Tag to set standards. By reserving tags, vScope can build custom content automatically based on the user input. A user defined and managed tag is called a “Manual tag”. The user can name this tag whatever he/she like and assign a custom value to it. 2.1 Who can assign tags in vScope? 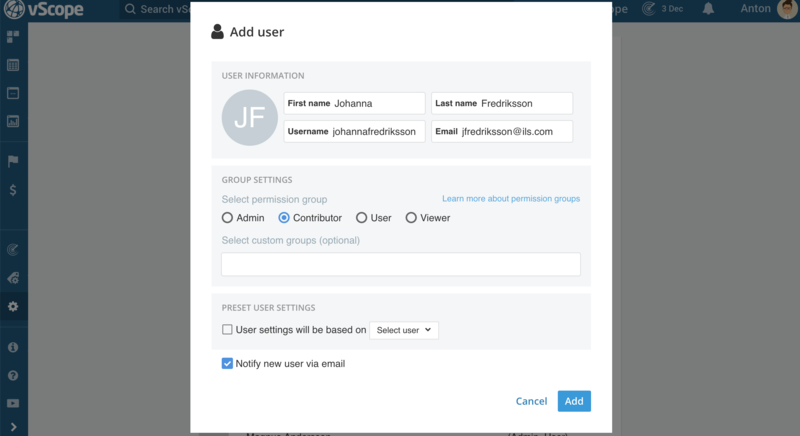 Permission level Contributor or Administrator is required to access tagging in vScope. Manual tagging means that tags are fully assigned and managed by the user. It is like adding a post-it to a folder. It is quick and easy but remember to update these manually in order for them to stay relevant. Tags can be assigned manually, one-at-a-time from both the Properties page and Table Explorer. Tags can easily be managed on the Properties page of each resource. Gray tags are assigned using Manual Tagging and Yellow tags are tags assigned using Rule-based tagging (see below). Add tags in bulk to multiple resources from Table Explorer. By using rule-based tagging it is possible to program vScope to assign tags to resources automatically. This is the recommended method of tagging and will allow automated categorization of resources. Based on specified rules, tags will automatically show up on any resource that matches that rule. In the filter panel, specify the rules that should be valid for the tag to be assigned to a resource. Notice that there is a preview of the result before clicking “Confirm”. Rule-based tags can be removed (or edited) from the Tag Manager . Manual tags can be removed from both Properties and Table Explorer. Tags can easily be removed from a resource by just erasing the input on the Properties page. 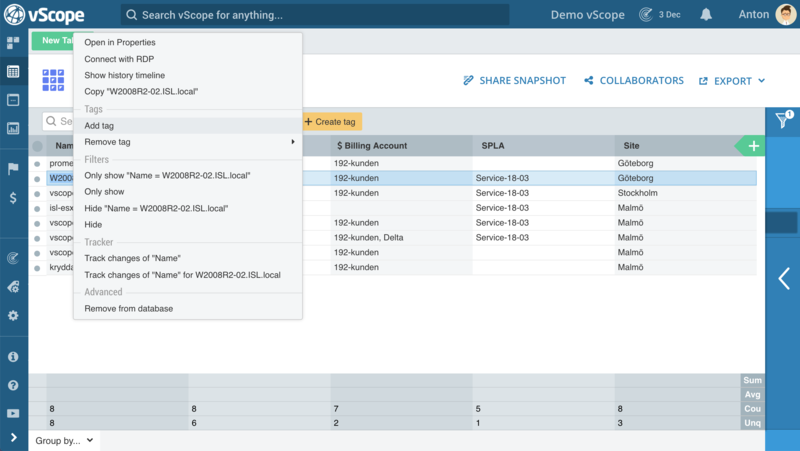 vScope automatically maps relationships between resources. This means that it is possible to see information about different resources in the same view. This is a powerful feature and saves a lot of time from not having to correlate the information. In order to view a tag from a related resource it is necessary to understand that there is a relation between two resources eg. server and a database. Here is an example of how to view a tag from a related resource. The tag has now been added by default to this resource. It is possible to hide this tag again in Tag manager. 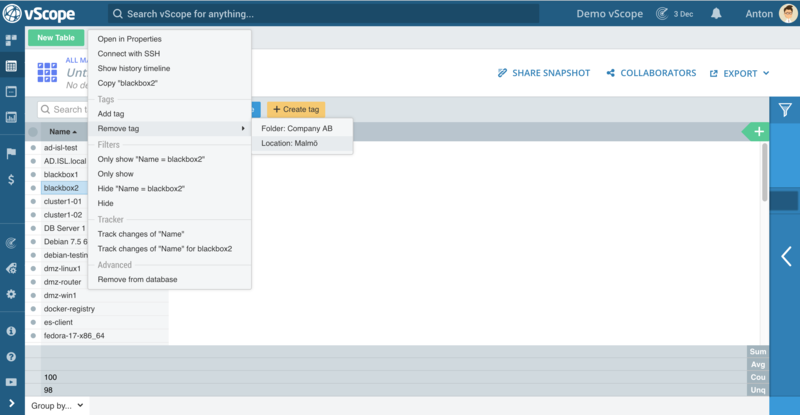 Learn more about Tag manager. 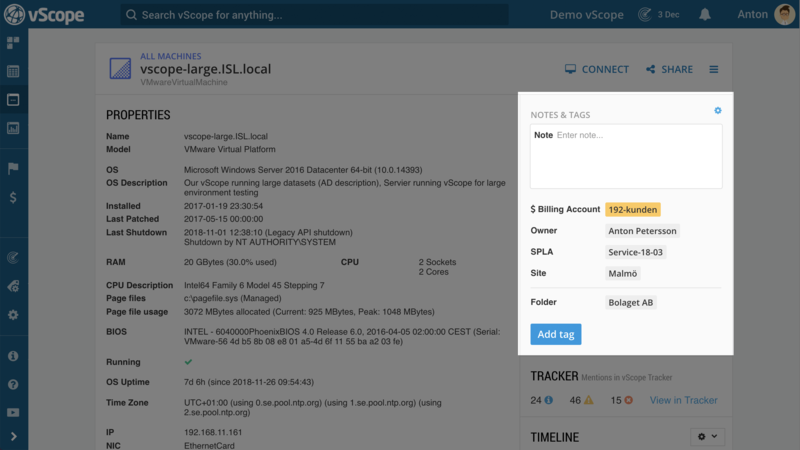 When adding tags to a resource, vScope will make suggestions from the default tags. 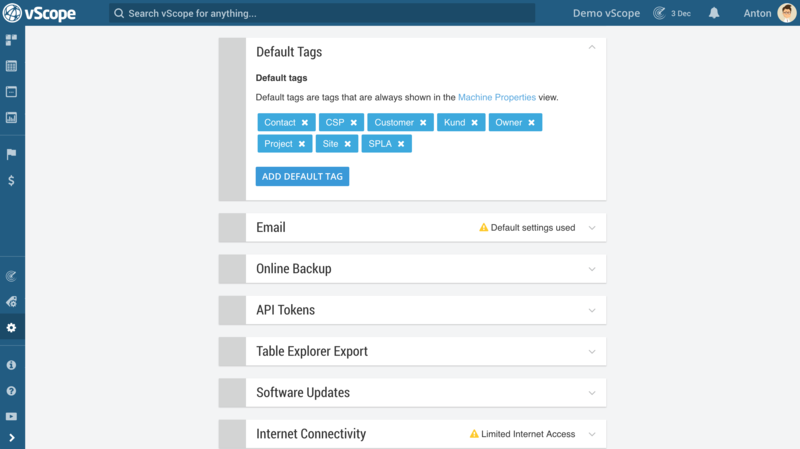 Manage these default tags from the Settings page in vScope. These tags will shown by default on the Properties pages.